A tough garden chrysanthemum that takes our heat and humidity. Slowly colonizes a corner of the garden and explodes with 2″-3″ pale pink Shasta Daisy-like flowers in the fall. It averages 18″-24″ tall when in bloom. Full sun or part shade. Moist, well drained soil. Butterflies! 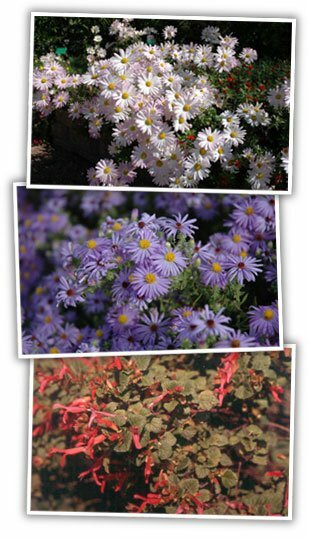 Outstanding native Texas, fall blooming aster! Mounds out to 2′-3′ with tiny gray-green aromatic foliage and is smothered with lavender daisies all fall! An excellent fall nectar plant. An incredible performer and very long lived. 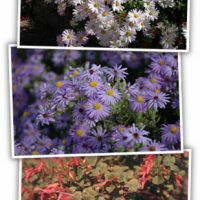 Tough and fairly drought tolerant once established. Full sun or light shade. Butterflies! An absolutely spectacular Salvia!!! This special Salvia is native to the Texas Hill Country. It has glossy green foliage on an upright 3′-4′ plant. In early fall, the ‘Mountain Sage’ is smothered with 2″-3″ long scarlet-orange tubular flowers for months! Will grow in full sun or light shade & must be well drained. Once established, it will reward you with a stunning display of fall color for many years to come. Hummingbirds!